As travellers, we suffer a relentless assault on our sensibilities. Long days followed by sleepless nights, cold showers absent water pressure, travellers diarrhea, unsanitary toilets, overnight buses, impossibly long layovers, exhaustion bordering on the brink of hysteria and the seemingly unending quest for wifi. All washed down with a potent cocktail of travel medications. For travel, you see, is much like a pearl necklace. The pearls represent the high points of travel, these are the memories we proudly display for our friends and family and the moments we are most likely to recall years down the road. Binding these pearls together, however, is a chain of moments best forgotten that tested our resolve along the way. So why do we endure such self-inflicted torture? For the chance to meet inspiring people, for the opportunity to widen the lens of the periscope with which we see the world and, every now and then, to see something truly epic. Under the shade of a cabana at Dancalan Beach in the Philippines, I watch a fleet of 7 catamaran boats circle the waters like predatory sharks, attempting to locate the monsters that reside just beneath the shimmering surface of Donsol Bay. Only 24-hours ago I was on board one of these vessels hoping for an opportunity to swim with giants. We scour the waters in search of a sign that indicates a whale shark is nearby. As the trail gets hot, the excitement of the 4-person crew on board crescendos and I, along with my 5 companions for the day, ready my snorkel gear. We move in unison like a battalion loyal to its commander. At the behest of our Butanding Interaction Officer (“BIO”) we pull on our flippers and frantically plunge one-by-one into the unknown. Visibility is poor, the water seems to be shrouded in a ghost-like milky-white substance. The blue expanse stretches on for what seems like eternity. Eerily, there are no other living creatures in sight, the sea does not offer up a single fish to foreshadow what is to come. Unable to discern the direction in which I am meant to be looking, I struggle to keep pace with the lightning quick flippers of our BIO until there is no other direction to look. Suddenly my periphery is overwhelmed by a polka-dotted mass moving towards me. 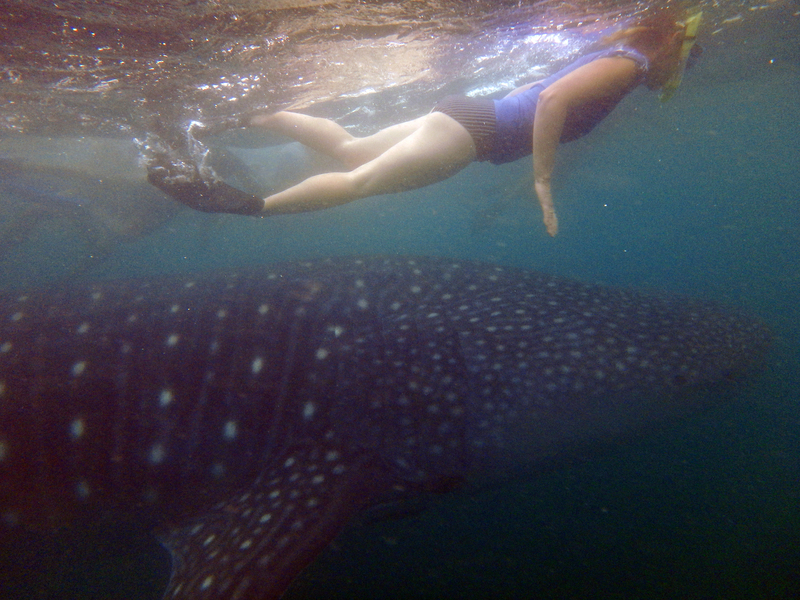 Next to a whale shark (locally “butanding”) it is impossible to ignore how insignificant we truly are. The whale shark tolerates us for a few precious moments before diving too deep to follow or effortlessly flicking its tail and vanishing into thin air. We are left with no choice but to ascend, retreat to the boat, regroup, rinse and repeat. No matter how many times we danced this dance, 7 on this particular day, I never failed to be completely caught off-guard when the silky white vapour gave way to a gaping mouth, impossibly large, affixed to a 10 metre long butanding that was gliding in my direction. All I could do was scramble out of the way, attempting to recall the safe distance to leave between myself and the gentle giant. A snorkeller sizes up against a whale shark in Donsol, Philippines. Over 500 kilometres away in Oslob, Philippines, visitors are virtually assured an encounter with the mighty butanding. Here, daily feeding of whale sharks has served to effectively domesticate the largest fish in the sea. Like Pavlov’s dog, the whale sharks that patrol Oslob have learned to associate the approaching fleet of boats with food. Mouths gaping, the beasts tolerate the human intrusion in their lives in exchange for an easy meal. Whilst the rumours of tourists being able to physically interact with the whale sharks appear to be unfounded, daily feeding of the sharks still raises major ethical quandaries. Though an incipient eco-tourism market stemming from the whale shark is key to its survival, without an incentive to pursue food, this disturbing development can lead to the eradication of migration and, in turn, cause a weakening of the gene pool. Still, from my shady cabana, as I watch catamarans approach Dancalan Beach, I cannot help but smile. As travellers, I realize that we have an opportunity to play a part in shaping the future. We get to choose to reward communities like Donsol with our hard earned savings instead of Oslob; a sort of natural selection of the travel industry if you will. Donsol was formerly a battleground where the familiar war between fisherman and oceanic resident played out. Like all conflicts between the greatest of apes and a compatriot species, this one was proving detrimental to the other species. Slaughtered en-masse by fishermen for becoming entangled in and sometimes breaking fishing nets, the Philippine government stepped in to protect the whale shark in Donsol when it realized that people around the world would pay to see them. Fishermen have chosen to trade in their fishing nets for lifeguard Rescue Cans and the entire community has embraced the slow tide of eco-tourism that is approaching its shores. Whale sharks are no longer hunted by humans here, well, if you ignore overeager travellers armed with go-pros anyway. Importantly, Donsol follows the wildlife eco-tourism golden rules: feeding of the sharks is prohibited as is touching them and boats are conscripted to fit propeller guards to their propellers to ensure the sharks are not injured by increasing boat traffic. Here too a nascent industry bourgeons as tricycle drivers ferret tourists back and forth, homestays welcome globetrotters from the other side of the world and restaurants prepare fresh Filipino adobo for adventurers. In Donsol, mankind and whale shark appear to have forged a symbiotic relationship that will hopefully benefit both for decades to come. Frial ducks in and out of traffic with his tricycle en route from Donsol town to the Dancalan Beach Visitor Centre. 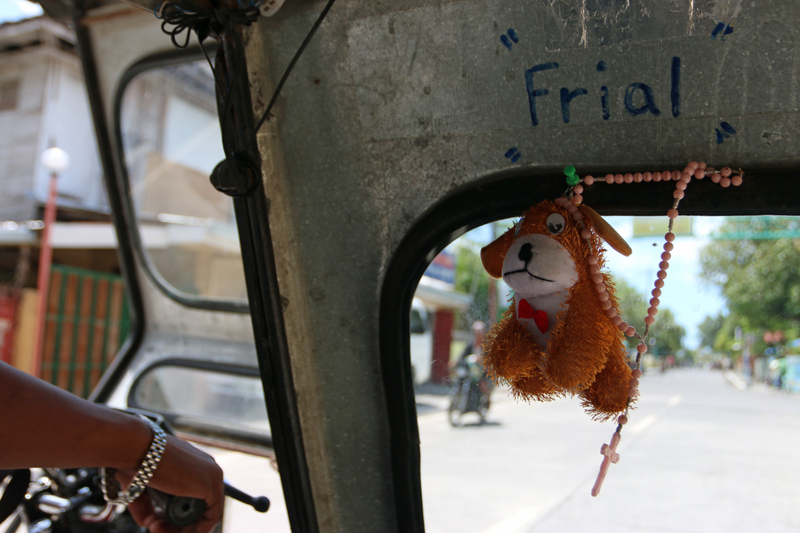 His stuffed toy looks slightly terrified. Back in my homestay I have another sleepless night, tossing and turning amidst the oppressive Philippine heat. An upset stomach serves as my alarm clock, I shower under droplets of water. Thirty minutes later, all of this was irrelevant as I swam head on into a 11 metre long whale shark, mouth gaping. This one acquiesced to my presence for several minutes allowing me to observe the prisms of light reflecting off its skin. It showed me the Remora fish that resides within its mouth and the impressiveness with which it uses its gills as a sieve. 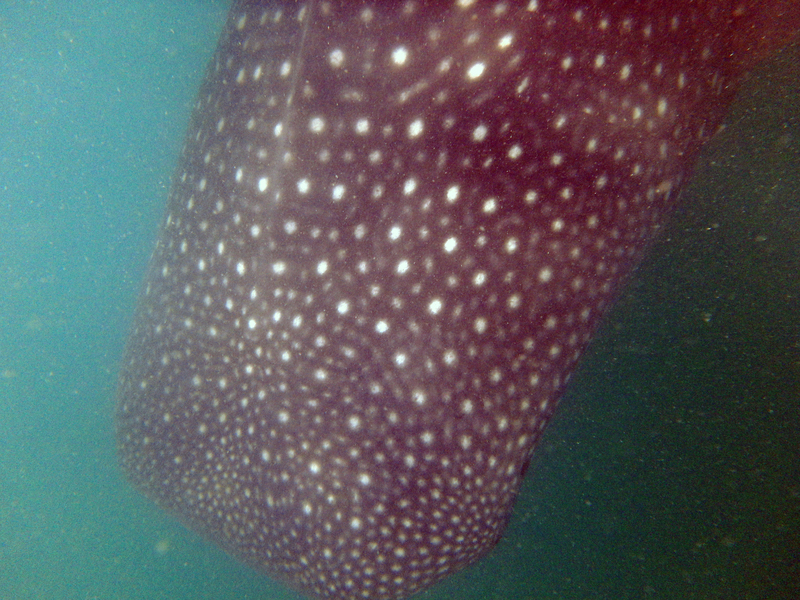 I swam alongside the butanding for as long as I could before retreating. I located my boat and emerged from the sea with another pearl for my collection. 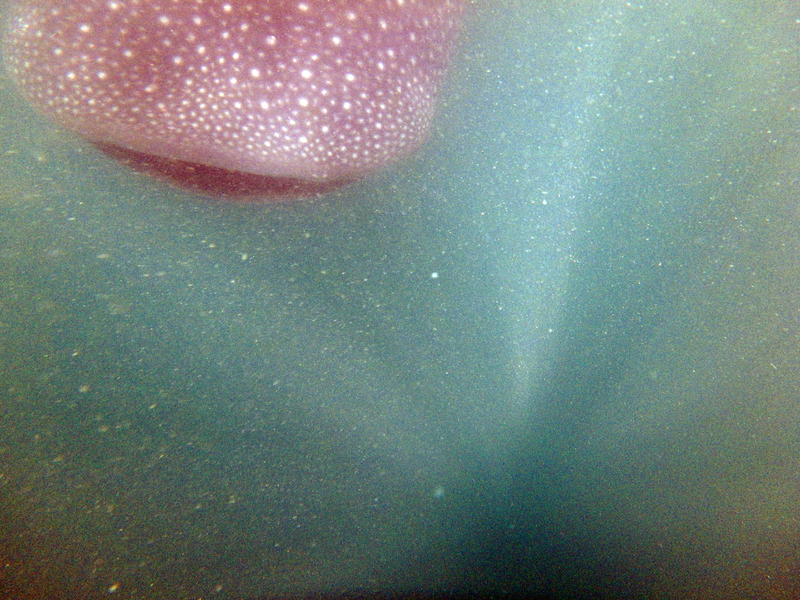 My first glimpse of a whale shark was often its yawning mouth amidst prisms of light as it hurled towards me. The next photograph in sequence. The massive whale shark dove beneath me allowing me to narrowly escape a collision with its mighty tail. Stay: Vitton Woods Resort on Dancalan Beach for its plush location right next door to the whale shark excursion registration office, well stocked bar, terrific view and lazy pool. For those on a budget, Siramsam is a good option offering charming cottages, a peaceful atmosphere and reasonably priced meals. If you’re keen on staying in Donsol town, Aguluz homestay is an affordable option run by a tireless woman with a lovely family. Try: The fresh crab at Vitton Woods, sundowners from a cabana at Siramsam Resort and, of course, swimming with whale sharks. Don’t: Show up in Donsol without sufficient cash, credit card machines are non-existent and ATMs are unreliable at best. Incredible! still can’t believe you did this. Well…actually I can.